Market opened the week with negative bias but rose by 150 points mid week, but later succumbed to selling pressure at higher levels. The upward momentum got interrupted by FED commentary of weak global growth prospects for the world economies. The markets were trading at overbought levels and the FED commentary gave the reason to begin the inevitable correction . The result scorecard were a mixed bag of positive and negative surprises. Yes Bank reported 27% Q4 PAT growth, while Axis Bank and ICICI Bank reported 1% fall 76% fall in Q4 PAT numbers respectively. Bharti Airtel reported 2.8% rise in Q4 PAT while IDEA reported 39% fall in Q4 PAT numbers. Dabur delivered 16% growth in Q4 profits while Ultratech and Indiabulls Housing Finance reported 10% and 23% rise in PAT respectively. Maruti reported a fall of 11.7% in Q4 PAT. The banking sector seems to be in the clean up mode and hopefully this quarter would be the last for disappointments, the recovery and incremental growth should start trickling in from the new financial year. The revival in the economy will make banks both PSU and Private sector the star performers of the year . Government has circulated a cabinet note to ban FDI in the tobacco sector a potential step to systematically kill the industry as no new funds would be allowed or the promoters of listed cigarette companies may not be allowed to buy the shares. In a report this week World Bank has rated SEBI higher than even the US and German regulators in the Ease of Doing Business matrix, a matter of great pride for the citizens of India. We are reiterating our previous week's comment "In the short term, rising spree in the market looks stalling as the market has formed a Doji on a weekly chart indicating either a pause or reversal to the lower levels" The market indeed witnessed some serious amount of profit taking. The strong resistance at 8000 NIFTY50 levels would be an important hurdle for the bulls to cross before restarting their upward journey. However in the near term correction can lead the markets back to 7500 levels. Traders intending to take long position should go out for May vacation or should be cautious before initiating long positions . The market is in the correction mode and should continue for some more time. Corporate results are not up to the expectations and have already been discounted thus leaving little room for a near term upside. Ujjivan IPO should be subscribed as it is reasonably priced leaving some room for the retail investors to make listing gains. Gross NPAs stood at 0.15%, the IPO is priced at 1.66x times the book with superior ROE of 19% and high visibility of sustained growth. Some of the heavy weights that are expected to announce the results next week are HDFC, Adani Ports, Adani Power, Century Textiles, Godrej Cons, MRF, HeroMoto, Eicher Motors, MCX, Titan etc. Bulls should exercise restraint and stay on the sidelines until the correction is over which may take some more time . Nifty 50 ended the week down by 0.62% and closed at 7850. The chart below shows the historical time cycles of bull, bear and corrective phases. Interesting facts throw a hypothesis that markets has strong probability that correction has already started and will take some more time before it is over. Market opened the week with an upside gap on hopes of rainy season but later fizzled out on the onset of result season. The results have started to pour in with mixed numbers. The IT heavy weights Infosys, TCS and Wipro came out with average numbers, while Infosys delivered above street expectations but TCS and Wipro disappointed. On an average IT companies are expected to grow in the range of 10%-13% for the next year which justifies their current valuation and leaves little room for further rerating barring Infosys which may outperform the pack. IndusInd Bank reported a healthy rise of 25% in Q4 PAT with NPA’s at 0.36%. Hindustan Zinc reported 8% rise in Q4 PAT. Equitas ltd listed at 33% premium to its issue price gaining handsomely on the back of rising bullish sentiments and reasonable valuation at which the shares were offered, the stock still holds promising future for the long term investors even at the current rate. The FIIs have slightly reduced their buying velocity they have infused some Rs 1600Crs in the month of April, while DIIs have sold shares worth Rs 1000Crs correspondingly. The fundamentals of the economy are strong enough to propel the growth upwards of 8% to 9% but that will require some time, however market discount’s too fast and therefore in the short term market have run up too fast and needs rest before starting the next move up. PSU banks got a reprieve from RBI this week when some of the truant defaulters started performing due to the pickup in the economy thus reliving the banks from providing against those stressed assets as bad or doubtful which cheered the PSU banks stocks on the street. Tata Steel unexpectedly got the support from the British government to facilitate the sale of its UK Steel assets paving the way for early disposal of the stressed assets thus lightning Tata Steel’s burden of managing loss making business and at the same time brightening domestic stock price. In the short term, rising spree in the market looks stalling as the market has formed a Doji on a weekly chart indicating either a pause or reversal to the lower levels. The ultra high short term bullish sentiments also point to some contra selling coming in the markets. NIFTY 50 will face stiff resistance at 8000 levels where in some meaning full profit booking is expected. Traders should be cautious before initiating long position at current juncture as the risk reward ratio looks unfavorable for positional trader. The market had run up too quickly in the short term and therefore it is very likely that the correction has set in for the immediate short term. Corporate results are mixed and seems are already discounted thus leaving little room for near term upside. An international brokerage house turned bullish on the steel sector this week, ironically the stock prices have already risen by 25% to 50%, however we did turn positive when the government first introduced the safe guard duty some two months back. Thyrocare IPO is richly priced, has little room on the upside for the short term investors, hence investors looking for quick listing gains can skip the same. Some of the heavy weights that are expected to announce the results next week are Ultratech, ACC, Ambuja Cements, Ibrealest, Ibulhsgfin, Yes Bank, Axix Bank, Maruti etc which will set the trend for the coming week. There seems to be near term caution for the bulls. Nifty 50 ended the week up by 0.62% and closed at 7899. Market opened the week in positive territory on hopes of a good monsoon. The big trigger came when Indian Meteorological Department (IMD) officially declared the Monsoon to be above normal at 106% which gave the reason to rejoice. Bulls fearlessly pushed the markets higher by 3.9% at the close of week. Further good news rained this week, IIP for the month of February bounced back to 2% reversing the deceleration since last three months, CPI for the month of March declined to 4.83% reversing the 6 monthly rising trend. Banks have started the spree of lowering the interest rates albeit with too little reduction. Axis Bank has taken the lead, & it is expected by 1st May many more banks will follow suit in reducing the lending rates. The economy is ready to leapfrog to new levels of growth with the advent of normal monsoon. We hope the economy is ready to take off with Rain Gods too now contributing their blessings on the Indian economy. Sun Pharma gets USFDA approval for eye care drug, a significant boost to the company’s brand image, it will increase pipeline sales growth numbers which will certainly cheer shareholders. Ricoh India came under regulatory eye when the company board asked their CEO, CFO and COO to go for leave, thus arousing suspicion on the conduct of the company especially when the company was reporting growth of 80% and above quarter after quarter. Liquor stocks have started to fizzle out as one state after another are planning to ban the consumption of liquor. 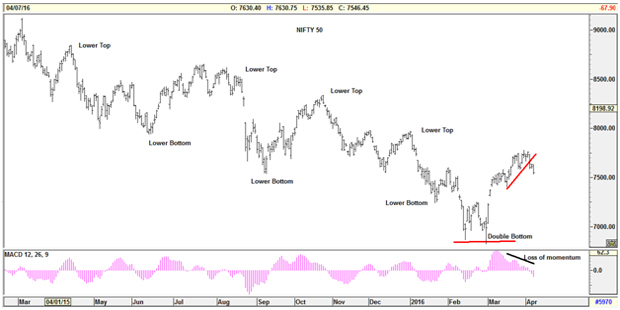 Short term higher tops higher bottoms spree in the NIFTY 50 will take the market to higher levels. 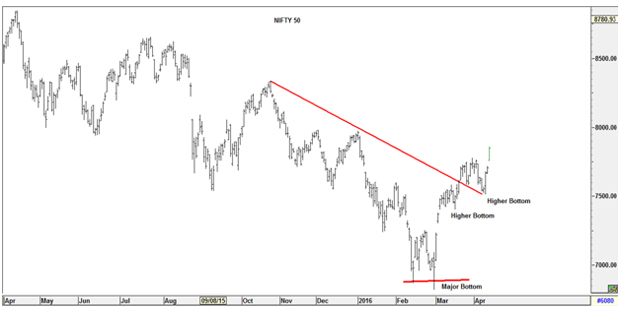 However at 8000 levels Nifty 50 shall face stiff resistance and major profit booking is expected. Traders should be cautious before initiating long position at current juncture as the risk reward ratio looks unfavorable for positional trader. Buy on dips should be the strategy. The market rebounded on hopes of normal monsoon; however the quick rally was based on hopes and expectations. The rain showers are still weeks ahead but the market discounts them too early too quickly. The media headline of ‘bounty showers soon' leaves little hope for further short term upside in monsoon related stocks. However the real tone of the market will set in, once the corporate results are out. Infy, TCS, Wipro, LICHSG, MindTree, Crisil, Hindalco etc will set the pace for the coming weeks. The results in general are expected to be muted with sales growth of 2% and profit growth of 8% are estimated at an aggregate level. 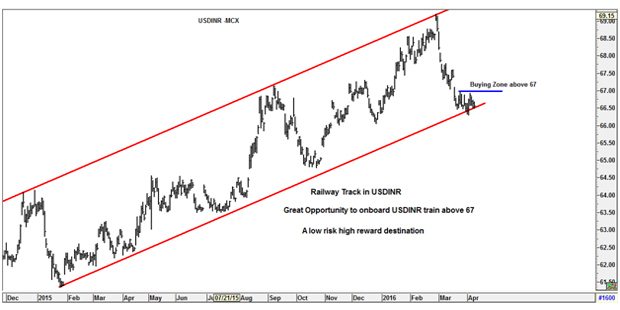 However USDINR could spoil the bullish stock market party if it starts moving above 67 levels. In the past a leading international brokerage house had predicted depreciation of emerging market currencies including that of Rupee by 7% to 10%. The undercurrent in the short term is cautiously bullish. Nifty 50 ended the week up by 3.9% and closed at 7850. Wishing all our esteemed customers HAPPY festivals. Market opened the week with positive mood but later sold off on account of lower than expected interest rate cut of 0.25%. However, Monetary Policy Statement was encouraging which gave lot of hopes for further rate cuts in the coming months. Services sector activities have steadily expanded in second half of the year, star performers being hotels, transport, defense and defense related services. Cement production too gained in H2 while steel consumption, air passenger traffic the lead indicators of the economy all marched ahead in the second half of the current year. Meanwhile Consumer Price Index (CPI) gave a major relief by falling for the first time in six months on account of lower food and vegetable prices. All these above domestic factors coupled with reduced risk to global downside gave an impetus for rate cut. We believe macro-economic dynamics in India are far more favorable presently than at any time in the past two years. We hope the economy is ready to take off with RBI too now contributing its weight behind to the prudent reform agendas of government pronounced in the budget. Adani Enterprises finally wins the coveted Queensland coal mines having potential of 11 billion tons of coal which will probably change the fortunes of the company. Blackstone has agreed to buy majority stake in Mphasis giving an open offer to public at 457/- making the M&A transaction one of the biggest in recent times in the IT sector. Preliminary forecasts have started to pour in for normal rains, the success of which will go a long way in reviving the growth for the country. "Stand up India" was launched by the government to revive and imbibe the entrepreneurial culture in the country. The market was witnessing loss of momentum in the previous week which eventually set the ball rolling for the correction to begin. The MACD indicator was in divergence with the price action. There will be strong support at 50% retracement levels of the entire rise which comes to 7300 Nifty50. Markets have entered into a short term corrective mode which will take some time to correct the entire post budget rally from 6850 to 7750. Traders should wait for entering into fresh long positions. Aggressive traders can go short keeping stops at previous week high. The market has started its natural course of correction after a strong rally of 900 points in Nifty50. RBI’s lower than expected rate cut has been blamed for the fall, but actually the correction was long overdue. Many of the best monthly performer stocks which had risen by 20% To 25% will fall sharply in this corrective phase. Sugar prices in the international markets have started to come off their recent highs which will potentially have negative impacts on the Indian stocks too. A leading international brokerage house has predicted depreciation of emerging market currencies between 10% to 15%, including those of India, China and Japan, which will cause negative impact on the stocks. The undercurrent in the short term as turned weak, there is loss of momentum, indicating correction has set in. Nifty 50 ended the week down by 2.04% and closed at 7555.